Copper gutters provide a unique look for your home that adds character and curb appeal. If you're looking for a unique finishing touch for your home, copper gutters are a great choice. Copper gutters will make your home stand out and provide you with a custom appearance while still offering the durability and performance you need from your gutters. LeafGuard by Midlands Home Solutions specializes in copper gutter installation, and we can help you determine what options are the right fit for your home. If you're interested in copper gutter installation, give us a call today at 1-844-807-6136 or click below to get started. We offer free estimates on all our work in Lincoln, Omaha, Council Bluffs and the nearby areas. No corrosion: Copper gutters and downspouts won't ever rust or corrode, providing excellent durability. Copper gutters naturally weather to a blue-green patina, but they can be cleaned to their original color or treated for a different color patina. Soldered joints: With other gutters, joints are sealed with special sealants that sometimes need to be renewed to prevent leaks. However, the joints in copper gutters are soldered together just like copper plumbing connections, so you never need to worry about leaks. Craftsmanship and quality: Copper gutters and downspouts definitely make a statement about craftsmanship and quality. Instead of blending into the roof structure like seamless aluminum gutters, copper gutters stand out, showing off their supports and their unique patina. 1. Brackets: A technician screws gutter brackets to the fascia board, allowing for proper pitch. 2. End caps: After the gutter has been cut to length, end caps are soldered to create a watertight seal. 3. Seams: Long gutter runs are created by soldering separate sections at the seams. 4. Holes" Workers drill a hole in the gutter at each downspout location. 5. Downspouts: Wall brackets secure each downspout to the sidewall. If you're interested in upgrading your home with copper gutter installation, LeafGuard by Midlands Home Solutions are the local experts you need. We can provide you with custom copper gutter installation that gives your home a beautiful finished appearance while also providing complete protection from water damage. Call us today at 1-844-807-6136 or contact us online to get started on copper gutter installation for your home. 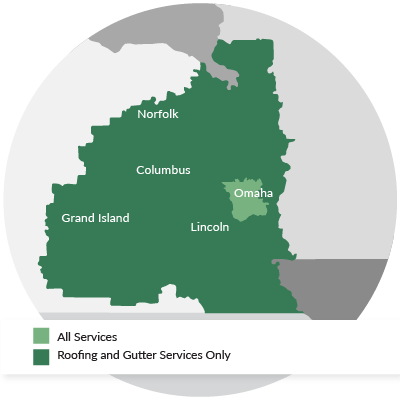 We offer free estimates on all our gutter services in Lincoln, Omaha, Council Bluffs, Bellevue, Sioux City, Kearney, Grand Island, Hastings, La Vista, Fremont and the surrounding areas.